UN Secretary-General expresses “solidarity” with families of kidnapped teens, hits out at Israel for its arrest operation. 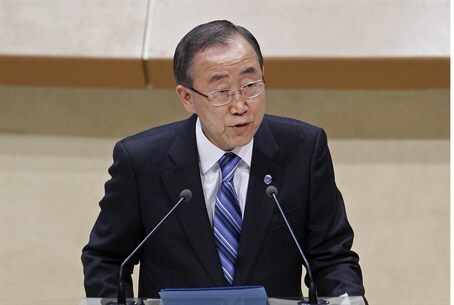 UN Secretary-General Ban Ki-moon on Sunday expressed “solidarity” with the families of the three kidnapped Israeli teenagers, but also hit out at Israel for arresting Hamas terrorists as part of its operation to locate the three teens. Netanyahu had told Ban on Saturday that the information in Israel's hands unequivocally indicates that Hamas is responsible for the abduction of the three teenagers, adding that this needs to be expressed in actions on the ground. Netanyahu stressed that the goal of the Israeli security operation in Judea and Samaria is to discover the location of the three abducted youths and that, therefore, it is focusing on Hamas. The conversation between Ban and Netanyahu comes several days after a spokesperson for Ban claimed that the UN has no "concrete evidence" that Eyal Yifrah, 19, Naftali Frenkel, 16, and Gilad Sha'ar, 16, were "actually" kidnapped by Hamas terrorists. The comments came after Ban had already condemned the kidnapping, noting particularly that two of the kidnapped Israeli students are minors. Netanyahu’s remarks in the conversation with Ban also come in the wake of a statement by the UN’s Middle East envoy, Robert Serry, who spoke out on Friday against Israel’s operation in Judea and Samaria to locate the three teenagers. While Serry called for the release of the three, he expressed “deep concern” over Israel’s arrest of wanted terrorists.